When you think about a backyard BBQ, you’re probably thinking about food. However, don’t forget about the drinks! A cool and refreshing cocktail is a great way to please adult guests. Consider making a big pitcher of a signature fruity and sweet cocktail for a balanced and delicious drink that saves time and keeps things clean. Now, let’s talk about the food. Get your mouth watering with delicious meats, such as steaks, pork chops, burgers, or hot dogs. Pair these items with a light pasta salad or garden salad for a balance between hot and cold. You can also choose to serve unique menu options, such as popcorn, onion rings, or classic french fries for picky eaters or children. Consider renting a popcorn maker for your next backyard BBQ. After your guests fill their stomachs with dinner, don’t forget to provide a tasty dessert. Consider seasonal fruit salad, citrusy cakes, or popsicles and ice cream. Kids and adults alike can end their evenings with these sweet and delicious treats. For a memorable event, consider sno-kone machines or chocolate fountains for an exciting dessert. 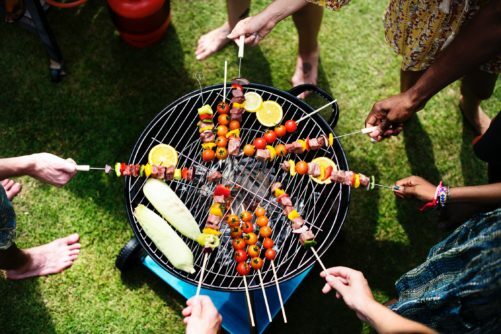 Your backyard BBQ can stand out when following these tips. Consider checking out the products available for rent at Pink Elephant Party & Tent Rentals for a memorable and easy BBQ. Rent tents to offer shelter and shade, chairs and tables to accommodate guests, and concession products to entertain and satisfy hunger. Learn more about what Pink Elephant has to offer by giving us a call at 631-357-3561 today!